In the last year or so, I've really moved away from eating white potatoes. I still love mashed potatoes, potato pancakes, and potato gratin, but most of the time Carla and I have been eating sweet potatoes. They take a little longer to cook, but I love their sweet, honey flavor and thick, creamy texture. Plus they have a lot more nutrients than regular white potatoes. But mostly I think their sweet, creamy flavor matches a lot of my cooking. It offsets the heat of spicy chiles, or plays up the inherent sweetness of pork. Sadly, the regular sweet potatoes have not been as satisfying as they used to be. Apparently Hawaii has been hogging the best sweet potatoes for ages. They're called (very descriptively) Hawaiian Purple Sweet Potatoes. 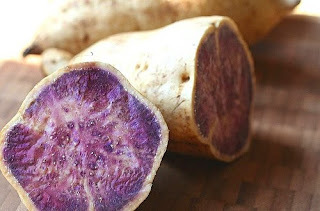 Japanese expats call them "Okinawan potatoes," after the Japanese Island they are believed to be native to. 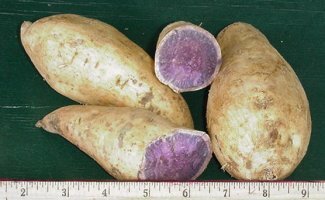 When the Polynesians moved to Hawaii, they brought the sweet potato with them. And they taste amazing. They don't taste different from a regular sweet potato, but all the flavors are incredibly intense. It's like tasting wild salmon next to farm raised. You can buy them in seed catalogs, but I wonder if the mineral content of Hawaii's volcanic soil is an essential component of the potato's flavor. We're looking into buying them online, but 30 lbs might be more sweet potatoes than even we could reasonably eat.